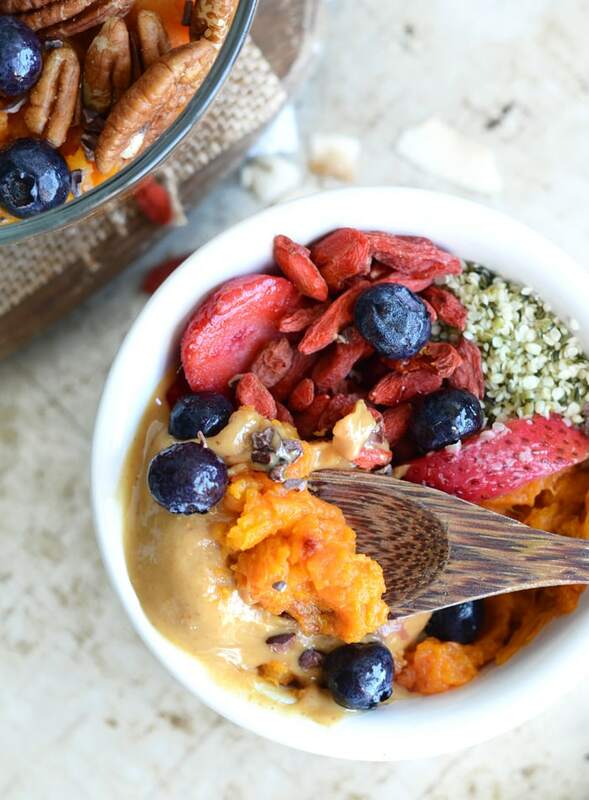 Sweet potato breakfast bowls are one of my favourite ways to start the day. 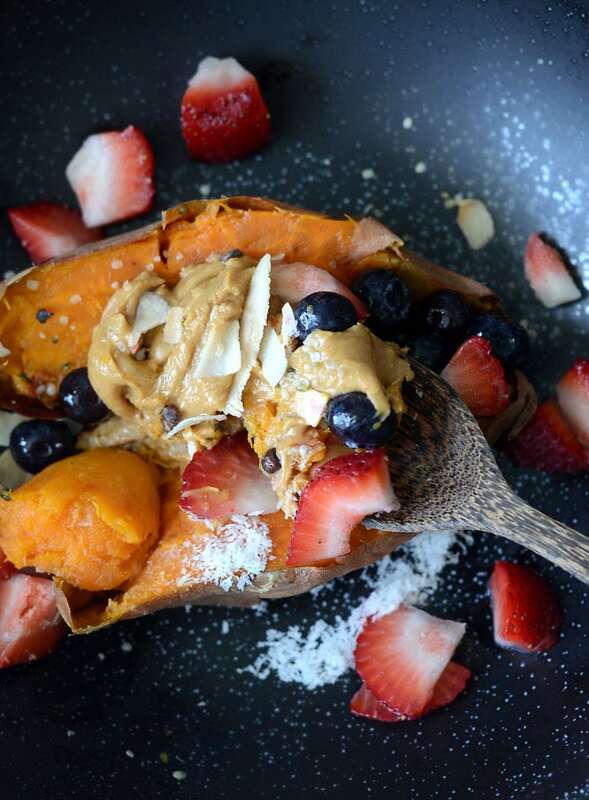 After a tough morning workout, sweet potato is an excellent source of carbohydrates to refuel with plus sweet potato breakfast bowls taste amazing and can be easily customized with fun and healthy toppings. You can create them just to your liking and you’ll never get bored because there are so many amazing toppings to choose from. When I make mine, I simply bake a couple whole sweet potatoes, then peel and store in a container in the fridge. 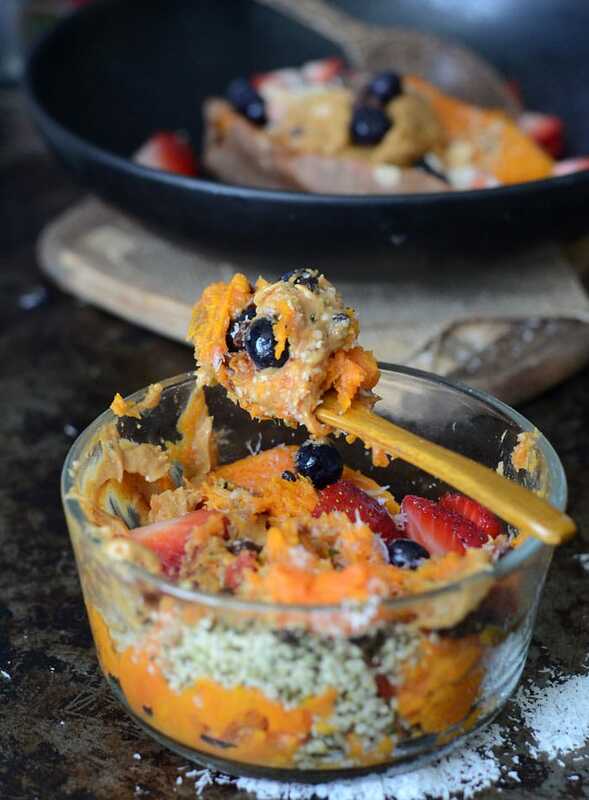 To make my breakfast bowl, I just mash the sweet potato up with a fork then add my toppings but you can also try some of the other options for the sweet potato listed below. If you can get your hands on small sweet potatoes, they’re my favourite for making sweet potato bowls. Just bake them whole, slice open and add your toppings. Cinnamon roasted sweet potato chunks are also amazing! 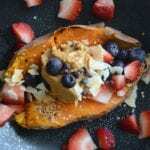 Check out the different options below for creating the sweet potato base for your breakfast bowls. I usually go with baked and mashed sweet potato but you can also chop the sweet potato first and roast for a chunkier breakfast bowl. It’s good to have options. This is also handy if you have some roasted sweet potato you need to use up. You can roast your sweet potato plain or add spices like cinnamon, ginger, nutmeg or pumpkin pie spice. Cinnamon and sea salt is my favourite! 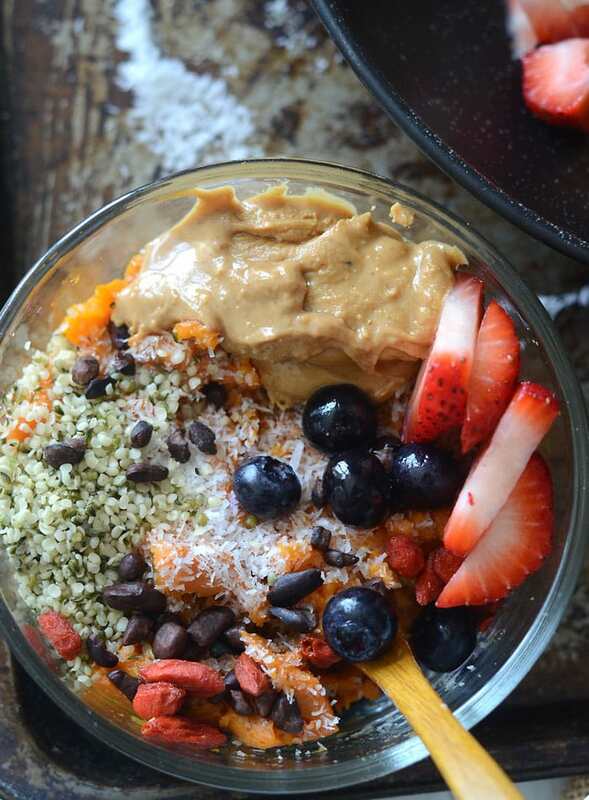 This is my go-to base for making sweet potato breakfast bowls. All you need to do is bake a whole sweet potato until soft and tender then use that as your base. I leave mine plain because I usually add some sweeter toppings but you could mix in some stevia or pure maple syrup. You can also try mixing in cinnamon, vanilla and a pinch of sea salt! This is another favourite of mine. To make a high-protein sweet potato base, simply mix, mash or blend your baked sweet potato with vanilla protein powder. This adds protein, flavour and depending on how much protein you use, a cookie dough like texture! You can also mix your sweet potato with pureed pumpkin, apple sauce or mashed banana for another fun flavour twist. Mixing it with pumpkin puree is delicious with some added cinnamon, ginger and nutmeg. 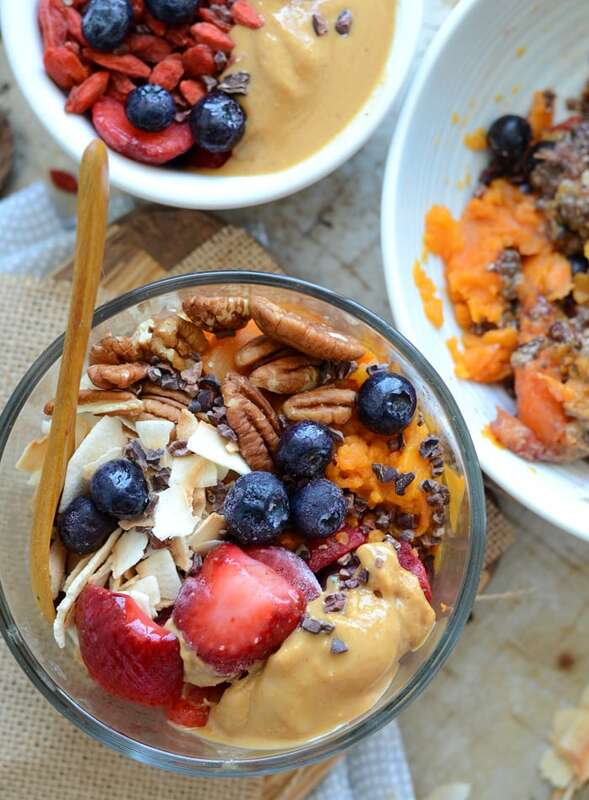 For the toppings, think pecans and maple syrup for a pumpkin pie sweet potato breakfast bowl. This is really good with vanilla protein powder mixed in too. Blend the baked sweet potato with chocolate protein powder or a few tablespoons of raw cacao for a chocolate sweet potato breakfast bowl! Get creative and have some fun with these! For today’s breakfast bowl we’re adding some of my favourite superfoods: hemp seeds, strawberries, blueberries, toasted coconut and cacao nibs and of course. 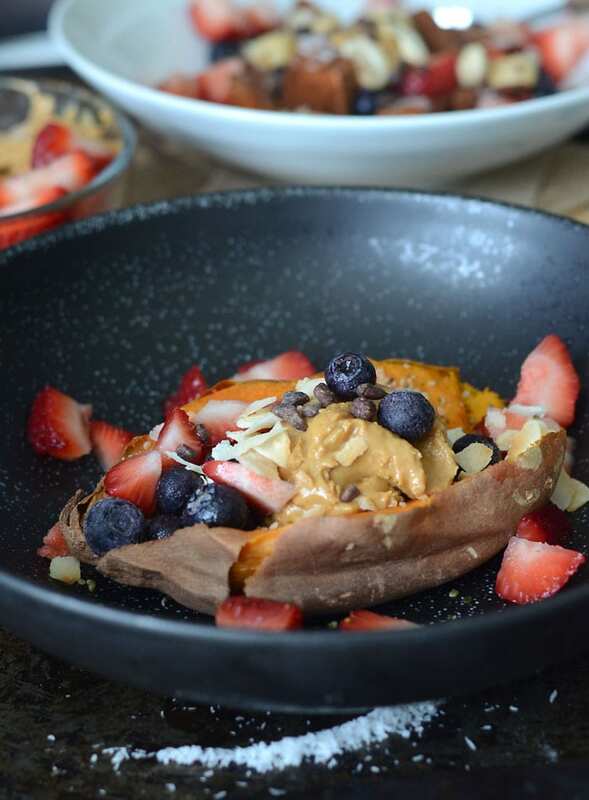 Follow the guidelines in the recipe or use this post as inspiration to create your own healthy and delicious sweet potato breakfast bowl. 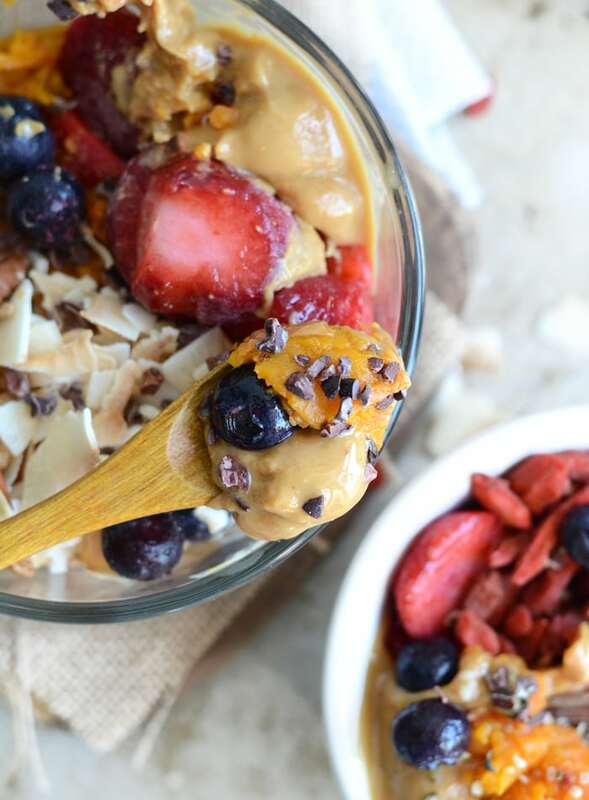 Sweet potato breakfast bowls are a wholesome and delicious way to start the day. All you need is a whole baked sweet potato, roasted sweet potato chunks or mashed sweet potato and you’re ready to load it up with your favourite toppings! 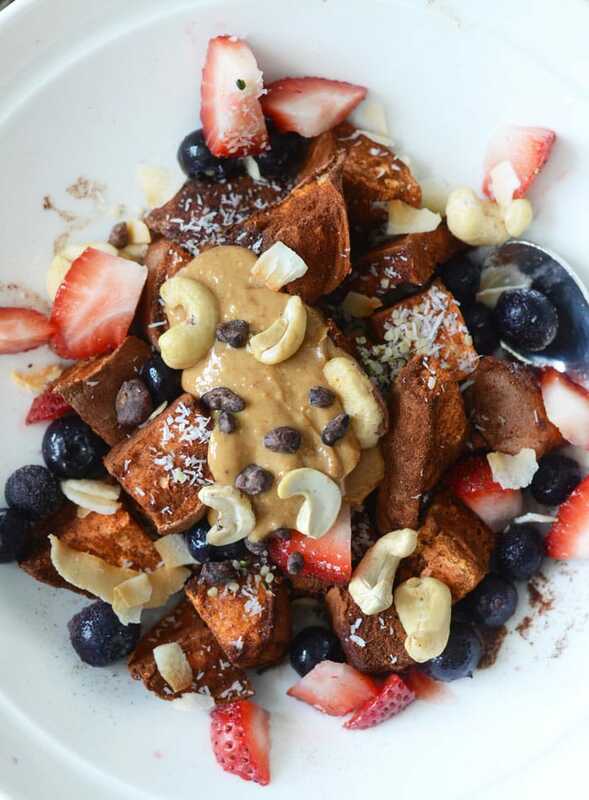 Follow my suggestions between for a peanut butter sweet potato breakfast bowl or use it as inspiration to create your own. 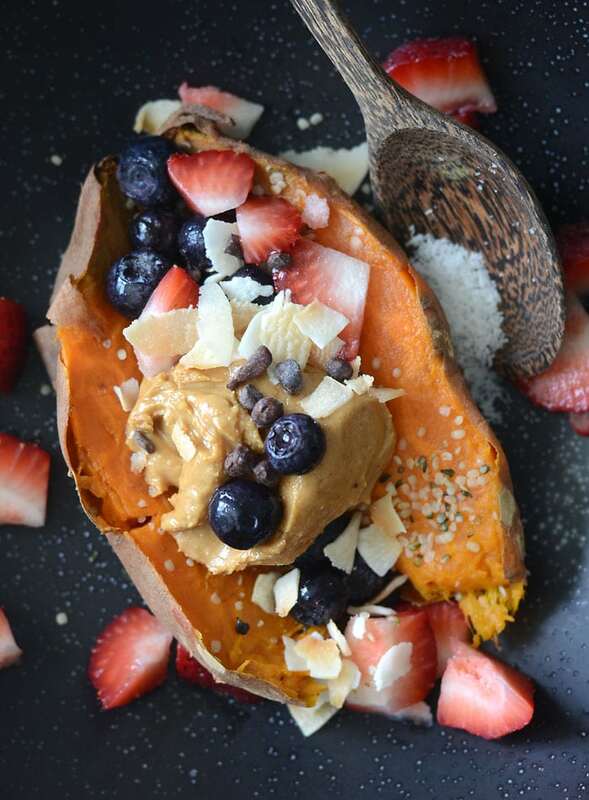 Place your mashed or whole sweet potato in bowl and top with the peanut butter, blueberries, sliced strawberries, cacao nibs and any other toppings you desire! 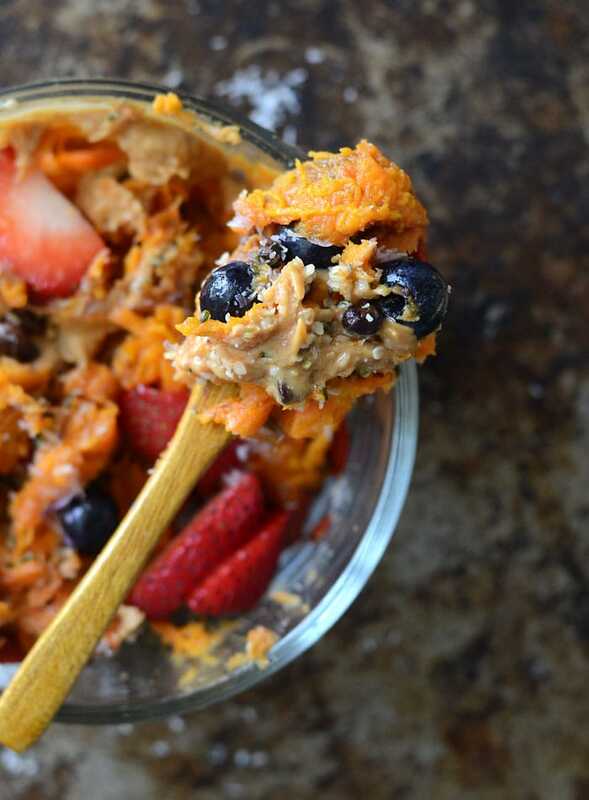 This recipe is simply a guideline for your own sweet potato breakfast bowl creations! For ideas, think of what you’d add to oatmeal and go from there! The preparation time does not include baking the sweet potato. If you don’t have cooked sweet potato on hand, cut a medium-sized sweet potato in half and bake face down on a baking tray at 400 F until easily pierced with a fork. This can take anywhere from 30-45 minutes. Sweet potatoes! This is one of my favorite foods! How long is the prep time by the way? Also, this is a good foundation for more complex recipes, so I might try to expand it, just like you suggested. Well if you bake the sweet potatoes in advance, the prep time is about 30 seconds! But baking the sweet potatoes can take 20-40 minutes or so depending on the size. Enjoy! I’ve never thought to eat sweet potatoes for breakfast. Such a great (and tasty) idea! Oh wow! this looks so filling and healthy! Would you make and store these in advance for a quick/to go breakfast? Do you think they would keep in the fridge? Or do you think it’s best to prepare each day rather than in advance? You can definitely prepare the sweet potatoes in advance and store them in the fridge. They’ll keep really well with dryer toppings like nuts, seeds, dried fruit and even nut butters. I just wouldn’t add fresh fruit as a topping in advance because it doesn’t keep very well, but you could prep the rest and just add the fresh fruit the morning of if you wanted it. I usually just prep baked sweet potato in advance and then add the toppings the night before I plan to eat it to so it’s a bit fresher 🙂 hope that helps! Can’t wait to give this a try! Do you serve warm? Not sure I’d love cold sweet potato. This is a fabulous idea! 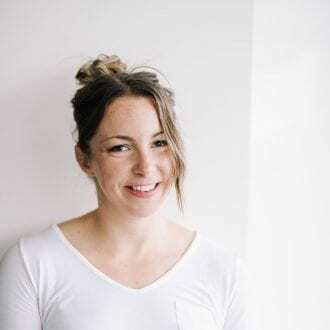 I bake sweet potatoes in my instant pot. So quick and easy. I often make 6 or 6 at a time. I never thought to do something like this. I work early mornings (5am) and am always looking for something healthy, vegan, quick and delicious. Thanks! Great idea to make them in the instant pot! You should try this before, I love them! One of my favourite easy and yummy breakfasts.